"This is a terrific recipe for holiday mornings. It can be used with many different kinds of fruits, but raspberries are so yummy!" Mix the flour, sugar, and baking powder together in a mixing bowl. Stir in 1 cup eggnog, butter, and the egg until well blended. Add more eggnog if needed to make a pourable batter. Lightly grease or spray the waffle iron with non-stick cooking spray. Pour some batter onto the preheated waffle iron, close the top, and cook until golden brown and crisp on both sides. Waffles are usually cooked with steam subsides. Transfer waffles to a serving plate, and keep warm. Meanwhile, place the raspberry preserves in a pan, and heat over medium heat until pourable. 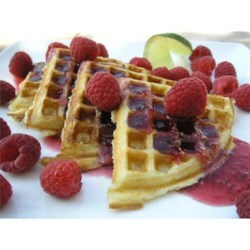 To serve, drizzle raspberry preserves over each waffle, and top with raspberries. If desired, add a dollop of whipped cream to each waffle. Make breakfast your favorite dessert! I just used this recipe for the waffles - didn't use the raspberries at all. Very yummy. Everyone - including in-laws - enjoyed the waffles on Christmas morning! we didn't make the sauce the the waffles were good. Ended up pretty soggy, and dense. Not the fluffy crisp delight that it was described as. I think main culprit is that the amount of eggnog is way to much for the amount of flour in the recipe.